Traci Braxtons' sisters have shockingly walked out on her and the show. Now, everything's changed. We've got an exclusive sneak peek at tonight's "Braxton Family Values"...with hardly any Braxtons. A reunion we didn't know we wanted did happen though. Check it inside. Traci Braxton had to make a difficult decision recently. After talking with her sisters and family about returning to the show, things reached a pivotal moment and now, her celebrity friends are rallying around Traci. As we told you previously, Phaedra Parks and Flavor Flav have joined the show. 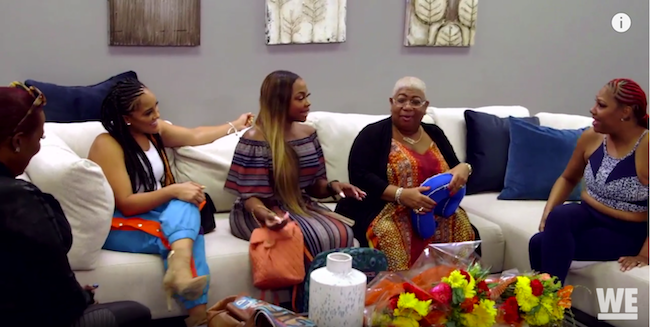 But when Phaedra makes her debut tonight, we see she's also joined by Natalie Nunn, Luenell and others. So if you're tuning in for the Braxtons, yeah, you won't be seeing most of them. But we're curious to see how all this plays out. Can't say we expected this reunion. But it's a doozy to see. "Braxton Family Values" airs tonight on WETV. NEXT: Meghan Markle & Prince Harry Are HUGE Hamilton Fans - The Duke Of Sussex Even Flexes His Vocals On Stage...For A Cause!